The Holy of Holies (Tiberian Hebrew: קֹדֶשׁ הַקֳּדָשִׁים Qṓḏeš HaQŏḏāšîm) is a term in the Hebrew Bible which refers to the inner sanctuary of the Tabernacle where God's presence appeared. The area was defined by four pillars which held up the veil of the covering, under which the Ark of the Covenant was held above the floor. The Ark according to Hebrew Scripture contained the Ten Commandments, which were given by God to Moses on Mount Sinai. King Solomon built the Temple in Jerusalem, where the Ark of the Covenant was supposed to be kept. The Crusaders associated it with the Well of Souls, which is located under the Foundation Stone of the Dome of the Rock. 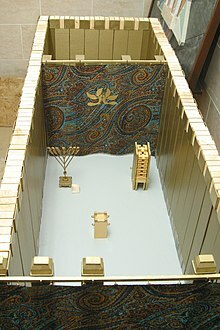 The construction "Holy of Holies" is a literal translation of a Hebrew idiom which is intended to express a superlative. Examples of similar constructions are "servant of servants" (Gen 9:25), "Sabbath of sabbaths" (Ex 31:15), "God of gods" (Deut 10:17), "Vanity of vanities" (Eccl 1:2), "Song of songs" (Song of Songs 1:1), "king of kings" (Ezra 7:12), etc. In the Authorized King James Version, "Holy of Holies" is always translated as "Most Holy Place". This is in keeping with the intention of the Hebrew idiom to express the utmost degree of holiness. The King James Version of the Bible has been in existence for over four hundred years. For most of that time, it was a primary reference in much of the English speaking world for information about Judaism. Thus, the name "Most Holy Place" was used to refer to the "Holy of Holies" in many English documents. A related term is the debir (דְּבִיר) transliterated in the Septuagint (the Greek translation as dabir (δαβιρ), which either means the back (i.e. western) part of the Sanctuary, or derives from the verb stem D-V-R, "to speak", justifying the translation in the Latin Vulgate as oraculum, from which the traditional English translation "oracle" (KJV, 1611) derives. Recipe and preparation of the oil for the Lampstand. According to the Bible, the Holy of Holies was covered by a veil, and no one was allowed to enter except the High Priest, and even he would only enter once a year on Yom Kippur, to offer the blood of sacrifice and incense. The Bible reports that in the wilderness, on the day that the tabernacle was first raised up, the cloud of the Lord covered the tabernacle (Exodus 40:33-40:34). There are other times that this was recorded, and instructions were given that the Lord would appear in the cloud upon the mercy seat (kapporet), and at that time the priests should not enter into the tabernacle (Leviticus 16:2). According to the Hebrew Bible, the Holy of Holies contained the Ark of the Covenant with representation of Cherubim. Upon completion of the dedication of the Tabernacle, the Voice of God spoke to Moses "from between the Cherubim" (Numbers 7:89). The Holy of Holies, the most sacred site in Judaism, is the inner sanctuary within the Tabernacle and Temple in Jerusalem when Solomon's Temple and the Second Temple were standing. The Holy of Holies was located in the westernmost end of the Temple building, being a perfect cube: 20 cubits by 20 cubits by 20 cubits. The inside was in total darkness and contained the Ark of the Covenant, gilded inside and out, in which was placed the Tablets of the Covenant. According to Hebrews 9:4 in the New Testament, Aaron's rod and a pot of manna were also in the ark. The Ark was covered with a lid made of pure gold, known as the "mercy seat" (Exodus 37:6) which was covered by the beaten gold cherubim wings, creating the space for the Divine Presence (Exodus 25:22). 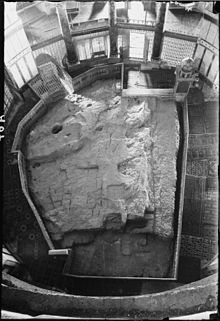 When the Temple was rebuilt after the Babylonian captivity, the Ark was no longer present in the Holy of Holies; instead, a portion of the floor was raised slightly to indicate the place where it had stood. Josephus records that Pompey profaned the Temple by insisting on entering the Holy of Holies in 63 BCE. 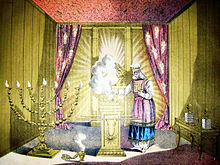 The Holy of Holies was entered once a year by the High Priest on the Day of Atonement, to sprinkle the blood of sacrificial animals (a bull offered as atonement for the Priest and his household, and a goat offered as atonement for the people) and offer incense upon the Ark of the Covenant and the mercy seat which sat on top of the ark in the First Temple (the Second Temple had no ark and the blood was sprinkled where the Ark would have been and the incense was left on the Foundation Stone). The animal was sacrificed on the Brazen Altar and the blood was carried into the most holy place. The golden censers were also found in the Most Holy Place. 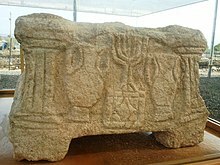 The Magdala stone is thought to be a representation of the Holy of Holies carved before the destruction of the Temple in the year 70. Traditional Judaism regards the location where the inner sanctuary was originally located, on the Temple Mount in Mount Moriah, as retaining some or all of its original sanctity for use in a future Third Temple. The exact location of the Kodesh Hakodashim[under discussion] is a subject of dispute. Traditional Judaism regards the Holy of Holies as the place where the presence of God dwells. The Talmud gives detailed descriptions of Temple architecture and layout. According to the Babylonian Talmud Tractate Yoma, the Kodesh Hakodashim is located in the center North-South but significantly to the West from an East–West perspective, with all the major courtyards and functional areas lying to its east. The Talmud supplies additional details, and describes the ritual performed by the High Priest. During the ritual, the High Priest would pronounce the Tetragrammaton, the only point according to traditional Judaism that it was pronounced out loud. According to Jewish tradition, the people prostrated themselves fully on the ground when it was said. According to the Talmud, the High Priest's face upon exit from the Holy of Holies was radiant. While under normal circumstances, access to the Holy of Holies was restricted to the High Priest and only on Yom Kippur, the Talmud suggests that repair crews were allowed inside as needed but were lowered from the upper portion of the room via enclosures so that they only saw the area they were to work on. Judaism regards the Torah ark, a place in a synagogue where the Torah scrolls are kept, as a miniature Holy of Holies. The Foundation Stone under the Dome of the Rock, a possible historical location for the Kodesh Hakodashim. The Crusaders associated the Holy of Holies with the Well of Souls, which is located under the Foundation Stone of the Dome of the Rock. Most Orthodox Jews today completely avoid climbing up to Temple Mount, to prevent them from accidentally stepping on the Most Holy Place or any sanctified areas. A few Orthodox Jewish authorities, following the opinion of the medieval scholar Maimonides, permit Jews to visit parts of the Temple Mount known not to be anywhere near any of the sanctified areas. Orthodox Jewish visitors to the Temple Mount, who come especially from those groups associated with the Temple Institute and its efforts to rebuild a Temple, seek to conform to the minimal requirements for coming near the Temple, such as immersing in a mikvah ("collection of water"), not coming during or following menstruation or immediately following a seminal emission, not showing their back towards its presumed location, and other strictures. To avoid religious conflict, Jewish visitors caught praying or bringing ritual objects are usually expelled from the area by police. According to the ancient apocryphal Lives of the Prophets, after the death of Zechariah Ben Jehoiada, the priests of the Temple could no more, as before, see the apparitions of the angels of the Lord, nor could make divinations with the Ephod, nor give responses from the Debir. The Greek New Testament retains the pre-Christian Septuagint phrase "Holy of the Holies" hágion (sg n) tōn hagíōn (ἅγιον τῶν ἁγίων) without the definite article as "Holies of Holies" hágia (pl n) hagíōn (ἅγια ἁγίων) in Hebrews 9:3. In the Vulgate, these are rendered as sanctum sanctorum and sancta sanctorum, respectively. The Greek language was the common language upon Hellenization of much of the Middle East after the death of Alexander the Great, and the division of his empire among four generals. The Jews of the Diaspora spoke it. The Latin Vulgate of St. Jerome was a faithful translation for Christian Rome. Certain branches of Christianity, including the Eastern Orthodox Church, and the Ethiopian Orthodox Church continue to have a tradition of a Holy of Holies which they regard as a most sacred site. The ciborium, a permanent canopy over the altar in some churches, once surrounded by curtains at points in the liturgy, symbolizes the Holy of Holies. Some Christian churches, particularly the Catholic Church, consider the Church tabernacle, or its location (often at the rear of the sanctuary), as their symbolic equivalent of the Holy of Holies, due to the storage of consecrated host in that vessel. The Greek phrase refers to the Tabernacle or Temple. The name in Greek for the sanctuary of a church is Ἱερόν Βῆμα (Hieron Vema, see Bema#Christianity), in Russian it is called Святой Алтарь (Svyatoy Altar - literally: "Holy Altar"), and in Romanian it is called Sfântul Altar. A cognate term in Ge'ez is found in the Ethiopian Orthodox Church: Qidduse Qiddusan, referring to the innermost sanctuary of an Orthodox Christian church, where the tabot is kept and only clergy may enter. This is also called the "Bete Mekdes. Every Ethiopian Orthodox Church has one, and it is covered with a Curtain. There are Three ways to enter (most of the time) and those three doors are also a way to reveal the Holy Trinity. In the middle there is always an Altar where the Church's Tabot is kept. There can be as many altars as the number of Tabots." A church of the Syro-Malabar Catholic Church in Kerala, South India still following the Jewish Christian tradition of keeping the Holy of Holies veiled by a red curtain in the tradition of the Ancient Temple of Jerusalem, much like their Orthodox counterparts viz. the Malankara Jacobite Syriac Orthodox Church and the Indian Orthodox Church. The Saint Thomas Christians (also known as Nasrani or Syrian Christians) from Kerala, South India still follow much Jewish Christian tradition. In Nasrani tradition the Holy of Holies is kept veiled for much of the time. The red veil covers the inner altar or the main altar. It is unveiled only during the central part of the main Nasrani ritual. The main ritual of the Saint Thomas Christians is the Qurbana (derived from the Syriac word "Qurobo" meaning "sacrifice"). The Latin Vulgate Bible translates Qṓḏeš HaqQŏḏāšîm as Sanctum sanctorum (Ex 26:34). Reproducing in Latin the Hebrew construction, the expression is used as a superlative of the neuter adjective sanctum, to mean "a thing most holy". It is used by Roman Catholics to refer to holy objects beyond the Holy of Holies, and is specifically often used as an alternative name for a tabernacle, due to the object being a storage chamber for consecrated host and thus where the presence of God is most represented. The Vulgate also refers to the Holy of Holies with the plural form Sancta sanctorum (2 Chr 5:7), arguably a synecdoche referring to the holy objects hosted there. This form is also used more broadly in Catholic tradition with reference to sanctuaries other than the Temple in Jerusalem. A notable example is for the Chiesa di San Lorenzo in Palatio ad Sancta Sanctorum, a chapel in the complex of St John Lateran in Rome. The Salt Lake Temple of The Church of Jesus Christ of Latter-day Saints (LDS Church) contains a Holy of Holies wherein the church's president—acting as the Presiding High Priest—enters to fulfill the relationship between the High Priest of Israel and God in accordance with the LDS interpretation of the Book of Exodus (Exodus 25:22) and Mormon religious texts. ^ a b Ritmeyer, Kathleen (1 January 2006). Secrets of Jerusalem's Temple Mount. Biblical Archaeology Society. p. 104. ISBN 9781880317860. ^ The Solomonic Debir according to the Hebrew Text of I Kings 6 J. Ouellette - Journal of Biblical Literature, 1970 - JSTOR "The immediate implication of this reading is that the holy of holies was built "from within the debir," that is ... The LXX simply transliterates dabir, while the Vulgate has "oraculum", thus suggesting a derivation from dbr "to speak." ^ The Damaged "blueprints" of the Temple of Solomon. L. Waterman - Journal of Near Eastern Studies, 1943 - JSTOR "The term "holy of holies" has long been accepted as a later descriptive term applied to the debir. The Hebrew word debir, rendered "oracle" in the versions, is a mistranslation based on a false etymology. The term itself signifies only the back or part behind, for example." ^ Kershner, Isabel (8 December 2015). "A Carved Stone Block Upends Assumptions About Ancient Judaism". The New York Times. Retrieved 9 December 2015. ^ Shragai, Nadav (1 September 2003). "Three Jews Expelled from Temple Mount for Praying". Haaretz. Retrieved 12 April 2017. ^ "NEW ADVENT BIBLE: Hebrews 9". newadvent.org. ^ a b Ross, Israel J. (1979). "Ritual and Music in South India: Syrian Christian Liturgical Music in Kerala". Asian Music. 11 (1): 80–98.